A new Facebook initiative is pushing for a Nobel Peace Prize nomination for the Israeli couple behind the Israel Loves Iran campaign. An online petition called on web surfers to support Ronny Edry and Michal Tamir as Nobel nominees. "If Ronny Edry and Michal Tamir would be honored with the Nobel Peace Prize this would be a significant affirmation for all those who seek peace. It would be an historic example," the petition read. Hundreds of Facebook users have already recommended the page to their friends. "Internet gives new chances for democracy and also for the international peace movement and this prize could encourage people to join us and become activists as well," Roya Mobasheri, the woman behind the petition, wrote. Mobasheri is most likely an Iranian expat living in Europe. "While governments are spreading hate and mistrust, and talking about war, people from Israel and Iran came together, connected and united for peace. The activists have a clear message to their governments: 'We love each other, we don't want war'". Mobasheri said that Edry and Tamir "raise a very important question: 'how could I hate somebody who I don't know?'.. One can say this exchange between people brought a real change on both sides and inside the people themselves. And this campaign proves: communication is the key to peace and also the key to real information." 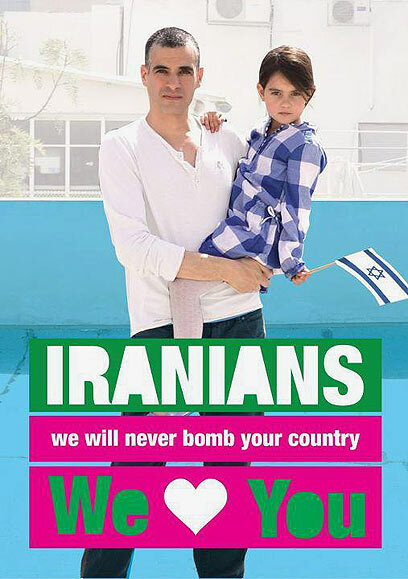 See all talkbacks "'Couple behind Israel Loves Iran campaign deserves Nobel'"